RAILROAD.NET • View topic - NY&LB beyone Bay Head? Did the New York & Long Branch ever extend beyond Bay Head? I vaguely recall that it once did and that it was cut back when a storm removed part of the barrier island it was on. Re: NY&LB beyone Bay Head? The PRR met the NY&LB at Bayhead and went on further south to Seaside Park then turned west at 14th Ave and crossed through S. Toms River and on over to Camden and Philly. Last edited by CarterB on Fri Mar 27, 2009 1:04 pm, edited 1 time in total. Re: NY&LB beyond Bay Head? When was that cut back? 1950s? Didn't the CNJ originally end the line in Point Pleasant? I thought at one point there were shops there until the PRR got involved with the NY&LB. The line did originally end in Point Pleasent but I don't know about the shops. The Point Pleasant CNJ Yard was located just north of where the station is now. It did have shops and a turntable at one time. JLo wrote: The Point Pleasant CNJ Yard was located just north of where the station is now. It did have shops and a turntable at one time. Thankyou, that is what I thought. This 1880 map clearly shows the roundhouse/tt and station. Great map, Carter. I never knew there was a church on the location of where I once lived! 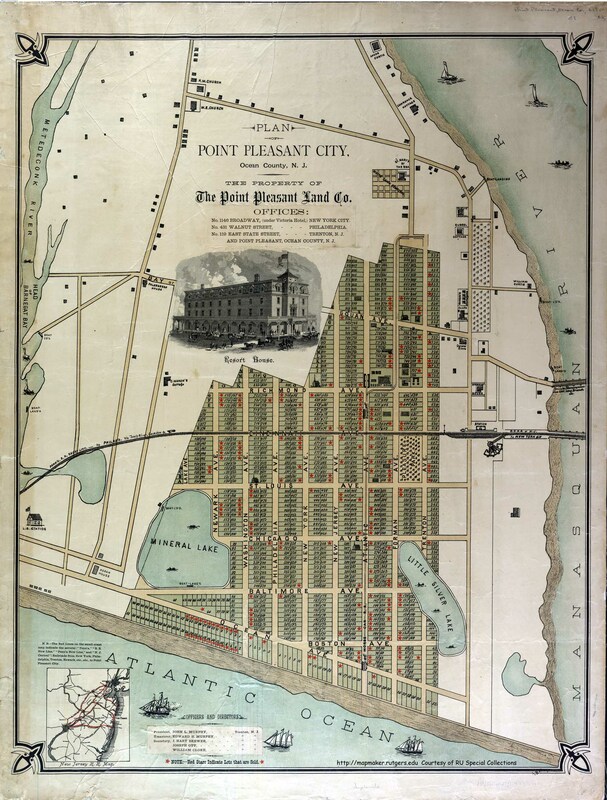 The connection between Point Pleasant and Bay Head was built as a joint effort between CNJ and PRR to connect to PRR's Philadelphia & Long Branch RR, opening in 1881. A bigger yard was needed and the CNJ Point Pleasant yard and shops were then closed. CNJ ended at Point because that town was the tourist destination, and Bay Head really wasn't, it was more of a year-round bedroom community. Bay Head also had enough room for the loop to be built, the CNJ Point yard had no room to expand. In those days, Pennsy only had NY&LB trackage rights between Bay Head to Long Branch, which was then the country's premier tourist destination. PRR had enough passenger traffic to need two ways to Long Branch, via Whitings, Toms River, and Seaside Heights, and via Jamesburg, Freehold, and Sea Girt. Long Branch-- How many towns in the United States have been visited by seven U.S. Presidents? If you guessed Long Branch, New Jersey, you’re right. They are Chester A. Arthur, James Garfield, Ulysses S. Grant, Benjamin Harrison, Rutherford B. Hayes, William McKinley, and Woodrow Wilson. Seven Presidents Park, near the beach, was named in their honor, and the Church of the Presidents (New Jersey) where all seven men worshipped is the only structure remaining in Long Branch that is associated with them. 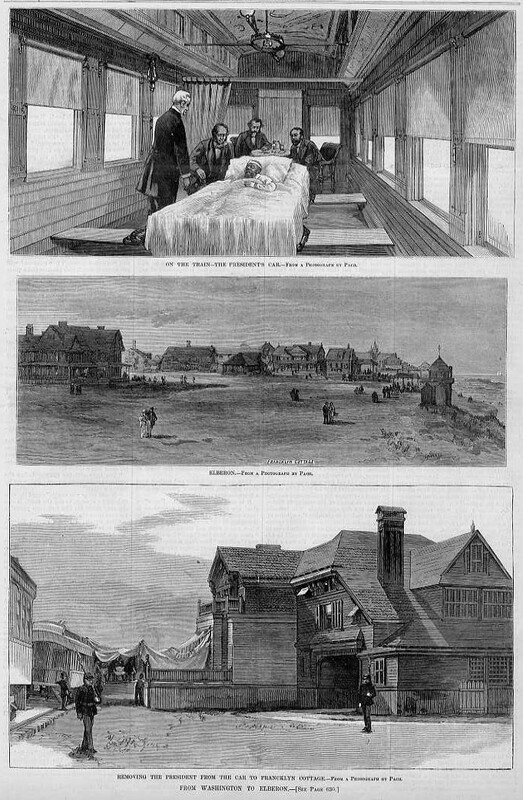 In the summer of 1881 in Long Branch, when President Garfield was convalescing from his gunshot wound, townsmen constructed a line of railroad track, more than a half-mile long, in less than a day so the president's car could be pulled right up to the porch of his summer house. Sea Girt - The National Guard camp was once the summer home to past governors of the state and was frequented b President Woodrow Wilson. Elberon- Chester Alan Arthur purchased a summer home in Elberon, on Park Avenue near the beach, in 1874. Mantoloking- Richard Nixon (1913-1994), former Vice President and President of the United States of America. Mr. Nixon summered here when he was Vice President. As an aside to this particular thread, Cape May quickly established itself as the United States' first seashore resort boasting famous visitors such as Abraham Lincoln (before his presidency) as well as many U.S. Presidents, including Woodrow Wilson, Rutherford Hayes, Ulysses S. Grant, James Garfield, William McKinley, Chester A. Arthur, and Benjamin Harrison. 3 US presidents 'summered' at Cape May. Congress Hall Hotel , which had gained a reputation as "the summer home of Presidents" Buchanan, Pierce, Grant, and Harrison who used it as a summer White House. Must have kept the railroads busy in summer months!! To expand on Carter B's post above, after Garfield was shot at Union Station in Washington DC, he was sped north via the Pennsy to Elberon, where it was thought the cool ocean breezes would help in his recovery. He was sped up the Pennsy Main Line to Trenton, and then up the Camden & Amboy to Jamesburg, and then to Freehold and Sea Girt, and then to Elberon. A spur track was built to the Elberon house overnight by CNJ employees and townspeople, other locals keeping the food and coffee coming as they worked. When the Pennsy train arrived, it was decided that the PRR engine was too heavy for the spur and a CNJ engine pushed Garfield's coach to the house. The breezes didn't help, as Garfield died there about two weeks later in Sept 1881. A rare photo of the car being pushed by the CNJ engine in Don Wood' "Unique New York & Long Branch" book.